From the very beginning the platers tried to make their wares resemble silver as closely as possible. It did no harm if the marks on them also looked rather like those on silver. 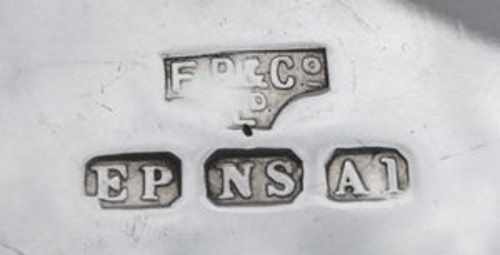 Since the early times Old Sheffield Plate presents initials and symbols in the same style and on the same places as did the silversmiths, sometimes repeating these devices to simulate the stamp of the assay office, the lion and the maker's mark. When in 1773 the silversmiths of Sheffield and Birmingham obtained to establish assay offices for silverwork in both towns, the "crown" symbol was chosen to identify Sheffield Assay Office (the "anchor" was chosen for Birmingham). One of the objective of the established Assay Office in Sheffield was to obtain some degree of control over the platers as the Parliament Act carried a clause prohibiting the striking of any letter, or letters, on goods "Made of metal, plated or covered with silver, or upon any metal vessel or other thing made to look like silver: the penalty being a fine of £ 100". The prohibition, more or less respected by Old Sheffield Plate makers of early 19th century, was largely ignored by electroplated silver makers of the Victorian Age (1837-1901). 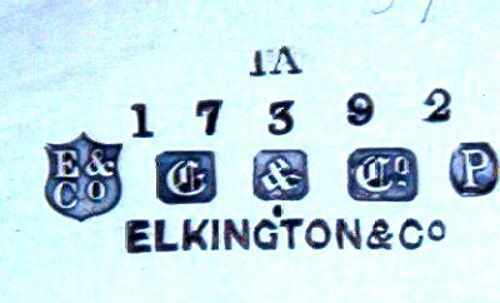 The use of pseudo hallmarks was a common practice and most of UK electroplaters adopted trade marks consisting in their initials coupled to '&', 'S' (for Sons or Sheffield), 'EP' (for Electro Plate) and a profusion of symbols inside outlines of various shape (circles, shields, squares), obtaining a result very similar to that present in sterling silver wares. One of the preferred symbols was the "crown", used by Sheffield Assay Office on sterling silver wares. The use of the "crown" on silverplate wares was tolerated for about 50 years, until, in c. 1895, a new intervention of the authorities reaffirmed the prohibition of the use of the crown in silverplate as it was seen as an imitation of the Sheffield silver mark. 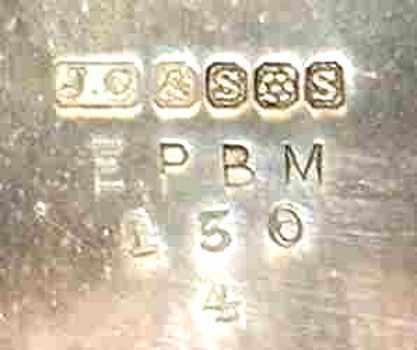 As a result of this intervention many electroplaters changed their marks deleting the crown symbol. 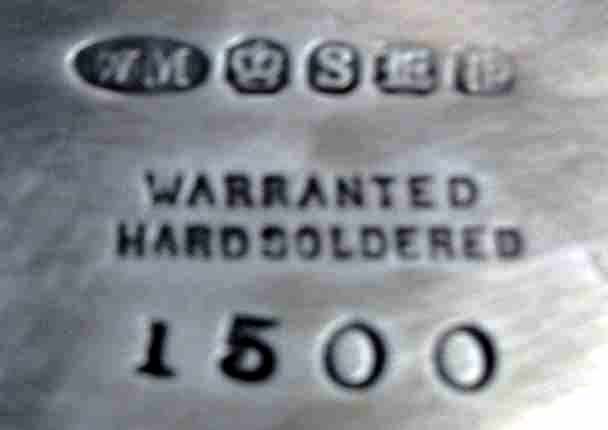 In this page is illustrated a selection of trade marks used by electroplaters "before" and "after" the 1895. Actually, some of these marks were modified before this date (change of the company name, 'modernization' of trade mark layout, changeover to Limited Liability Company, etc.) but most of them have been a direct consequence of the threat of legal action by Sheffield Assay Office. The Sheffield Assay Office was established in 1773 and the symbol of its mark was a "crown". It was applied with various ranges of punches in proportion to the sizes of the objects on which they were stroked. 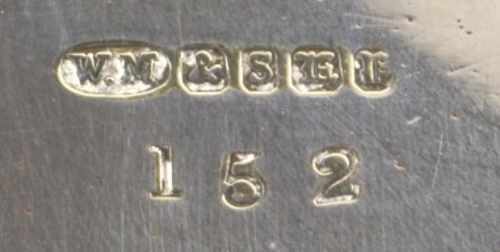 From the year 1815 to 1819 the crown is consistently found stamped upside down. The most probable explanation of this practice was to differentiate more clearly between letters that were being used at this period and those struck in earlier years (example letter X in date letters in the years 1797 and 1817). An innovation entirely different from the procedures of other offices was the method adopted, dating from the year 1780 until 1853, of stamping the mark of origin and date letter combined in one punch. Probably designed for striking on small articles where space was limited, the punches came eventually to be used on all classes of sterling silver wares. 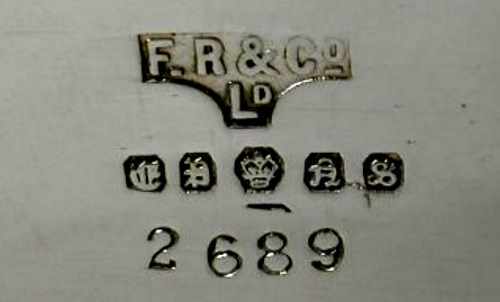 THE "CROWN" ON SILVERPLATE TRADE MARKS : "BEFORE AND AFTER"
In this page is illustrated a selection of trade marks used by electroplaters "before" and "after" the 1895. Actually, some of these marks were modified before this date (change of the company name, 'modernisation' of trade mark layout, changeover to Limited Liability Company, etc.) but most of them have been a direct consequence of the authorities' intervention.